Charleston Coastline, 5’9” x 18’9”, is a 5 panel batik on shantung silk. 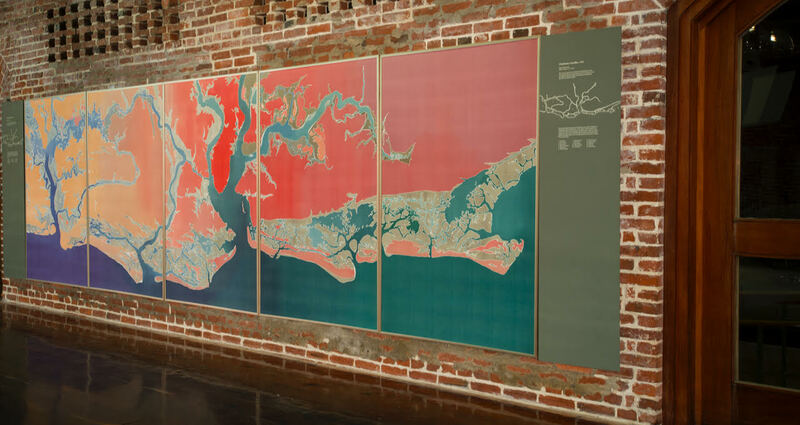 The center panel features the Charleston peninsula in bright red, bordered by the Cooper River on the right and the Ashley River on the left. Barrier islands to the right of Charleston Harbor are Sullivans, Isle of Palms, Dewees, Capers and Bull. To the left are Morris, Folly, Kiawah, Seabrook and Botany Bay. The large body of water in the far left panel is the North Edisto River flowing into Wadmalaw. Daniel Island sits between the Wando and Cooper Rivers. The intra coastal waterway runs between James and Johns Islands. Reds and oranges represent land while the taupes depict marsh. Looking at this animated aerial perspective of land meeting water, one can understand why the area is called “The Lowcountry”. A second negative image made by the water is a gnarled oak tree with its branches the rivers and its roots in the islands below.